Her family has never talked about what happened that led to Nooria losing one of her arms. Nooria only knows that her arm has been cut off after getting hit by a rocket shrapnel. Although this question may sometimes be crafted for Nooria, she cannot ask her family! But this has never prevented her efforts from reaching her goals. 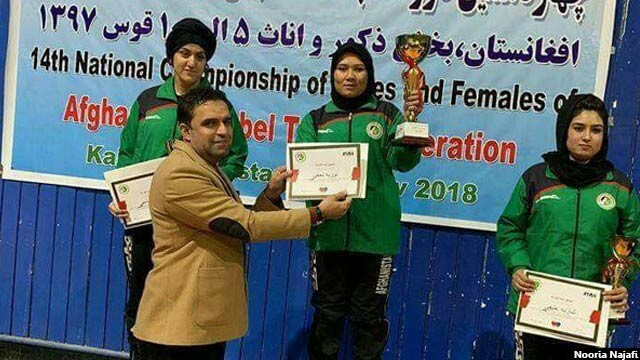 She has been one of the top players in the Ping Pong team for six years now and no one can match up to her in Afghanistan. This success proves that disability cannot stop her from making reality out of her aspirations and desires. Nooria Najafi, born in 1996, is from the district of Nahor, Ghazni Province, who now lives in Kabul. She is a member of the National Ping Pong team in Afghanistan and one of the top athletes in the country. She has earned her bachelor’s degree in Physical Education from Rabbani University. Nooria was born and raised in an eight-member family with an average economic status. She became differently-abled at childhood and lost one of her arms as a result of a rocket shrapnel. She was fond of playing ping pong sports since childhood and played it for fun. But she started to specialize in it when she was in the 9th grade at school. Nooria, who graduated from Zaynab Kobra School, was accepted to study her favorite field of studies after passing the university entrance exam; she received a degree in physical education and graduated from the field last year. Besides her engagement in sport, she is now the deputy chairman of the Social Council for Women with Disabilities through which she focuses more on creating motivation among women and children with disabilities; with her disabilities, she creates a sense of life and hope for those who think that life is about to end. “As long as I’ve been working on this council, many children and women have had a disability and were different from me, and all our work is different because I do not think I’m disabled, but many of these women and children are always dissociable. They are trying to get away from the community and the people; they feel they cannot do anything! ” Nooria added. Her biggest support on this path is her family. 21-year-old Nooria is a physical education graduate and is familiar with all types of sport, and she is skilled in three sports-ping pong, court tennis and badminton. She has attended 20-25 domestic matches in Afghanistan since the ninth grade and after a year of training. For almost six years, Nooria is the No.1 Ping Pong player in Afghanistan. Nooria has been No.1 among the differently-abled and non-disabled people in the various competitions. This is while the Ping Pong championship has not yet been set up in the disabled section in Afghanistan and no team been considered for them. There are 10 members in the Ping Pong National team of Afghanistan, who are selected each year from provincial women’s teams. 35 women from Afghanistan are members of the Ping Pong Provincial Teams, of whom 10 are in the National Team. The ten are from different provinces such as Ghazni, Herat, Balkh, Helmand, Sar-e-pul, Jawzjan, etc. In the latest Ping Pong National Selection Championship held two months ago, Nooria was again at the top of the 10 players list. 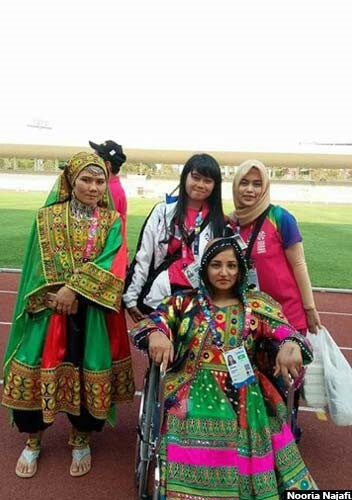 Nooria has also attended the Asian Para Games Championships in Jakarta. Nooria now wants to attend Olympics or the Paralympic Games 2020 in Japan, but the problem of Nooria Najafi in participating for the tournament lies in the lack of support from the ping pong federation. “The motivation for this decision was created before my trip to Jakarta,” she said. 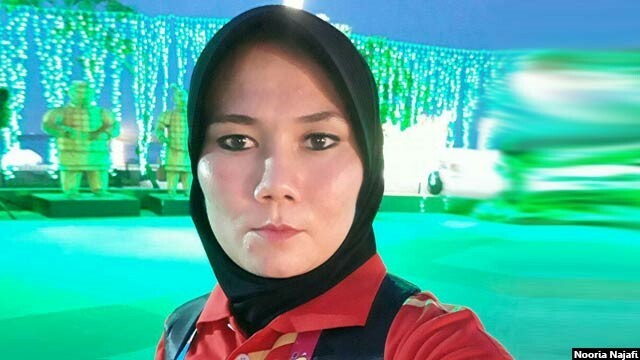 “I am now struggling to get to the tournament with intense drill, and to bring an achievement, even minor, for my country,” she said. Nooria’s master and coach are struggling more than anyone else to help her reach the Olympic Games. They are waiting for a trip to be made to go earn quotas and get into the tournament. Nooria thanked her coach Jawid Sharafi, who is supporting her to achieve her goals, and also thanked the “Leadership Board of Red Crescent” for providing them accommodation and facilities for training. Nooria’s ambition is to bring achievement for her country. She also wants to lead the Ping Pong federation someday.